Nomad Furniture beds have a sturdy slat system to provide firm support when combined with a good mattress. Our slat system removes the need for a box spring and thus lowers the bed to a comfortable height. We offer many different heights to fit your particular need and mattress thickness. All of our beds are easy to both assemble and, later, disassemble for moving. Our beds are very sturdy when assembled. It is easy to move the bed as a whole, just turn the bed on its side, and move it through doorways to other rooms. You can rest on our assurance of a good nights sleep. All Nomad beds are available in American red oak, hard maple and natural or caramelized bamboo. Step 1: Take parts out of the box. All assembly should be on a rug or carpet to prevent scratching the wood as you assemble. Identify the parts. In this picture we have from left to right: slats, rails, center support, drilled crosspieces, slotted crosspieces and headboard slats, and legs. You will need a #2 Phillips screw driver and a rubber mallet or hammer with a block of wood (in box) to prevent denting. A friend is handy too! Install 4 - 5/8" shoulder screws in headboard and foot-board drilled crosspieces. These shoulder screws will support the center support. The lower set of screws on the legs attach to the crosspieces, the higher set of screws attach to the side rails. The ends of the crosspieces and rails are tapped down over the screws. Notice the alignment of the shoulder screws to the end metal in the crosspiece. This is the correct starting position of the two parts when assembling. The crosspiece will be pushed down over the screw and tapped down with a mallet/hammer. Step 3: Assemble the foot-board. Attach the drilled crosspiece to the foot-board leg using the lower set of shoulder screws. The shoulder screws on the foot-board face inward. Push the crosspiece down over the shoulder screws. Step 4: Tap down Crosspiece. Using a rubber mallet (in a baggie to prevent black marks) or a hammer (using a wood block to prevent damage to crosspiece) tap down crosspiece with firm smacks until snug. We send a block of wood in the packing box for your use. Attach the other foot-board leg and tap down snug. The foot-board is finished. Place it aside, maybe against the wall. Attach the lower crosspiece, with shoulder screws to the lower set of shoulder screws on one headboard leg. Line up the end of the crosspiece and shoulder screws and tap down snugly. Set aside this assembly. You will add the other leg after you get the head-board attached to this leg. On the eastern edge of Albuquerque there is a mountain that rises 5000 feet from town. That mountain changes every day and all though the day but it always gives a beautiful Vista to those who live here. The Vista bed was designed knowing that the grain of our Bamboo boards shows its beauty well on a large scale. The main feature of our Vista bed is the solid Bamboo panel that is 20” high and wider than your mattress. That wide Bamboo panel gives a stunning exotic look to the Vista bed that is hard to beat. The Vista bed is 3” higher than our standard beds since the panel extends well above the legs. The Vista bed legs are also available in different heights for different mattress thicknesses. This Vista bed is NOW AVAILABLE IN OAK, MAPLE, or BAMBOO. Sizes Twin, Double, or Queen. 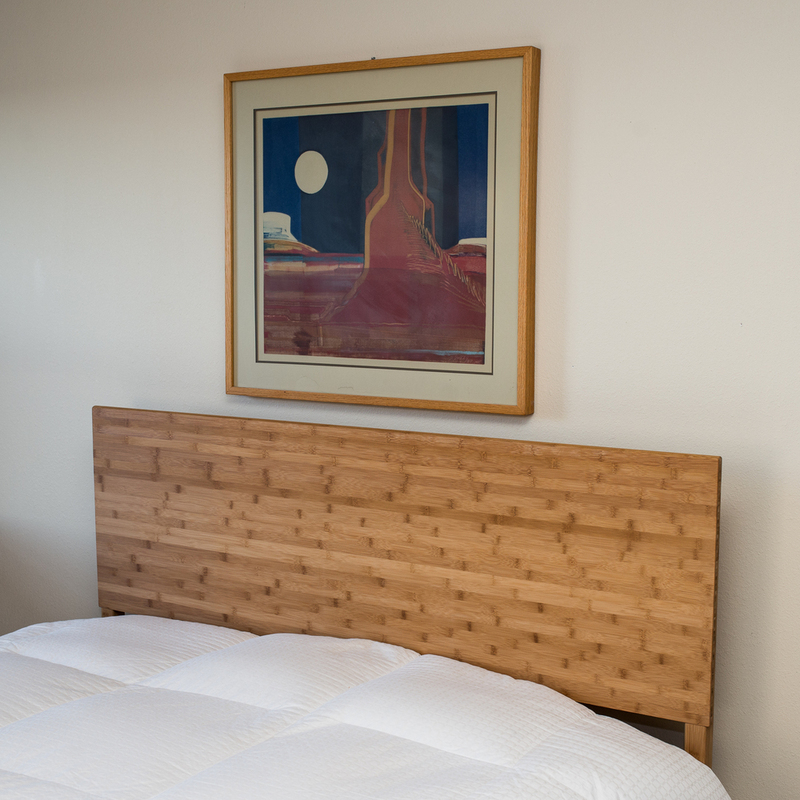 Our Vista Mesa bed shows off the grain of our bamboo boards very well. The bamboo jumps out to grab the eye of the observer. This version of the Vista bed uses a simple flat top instead of the curved top. Available in Oak, Maple, Light or Dark Bamboo. Available in Twin, Double, or Queen. 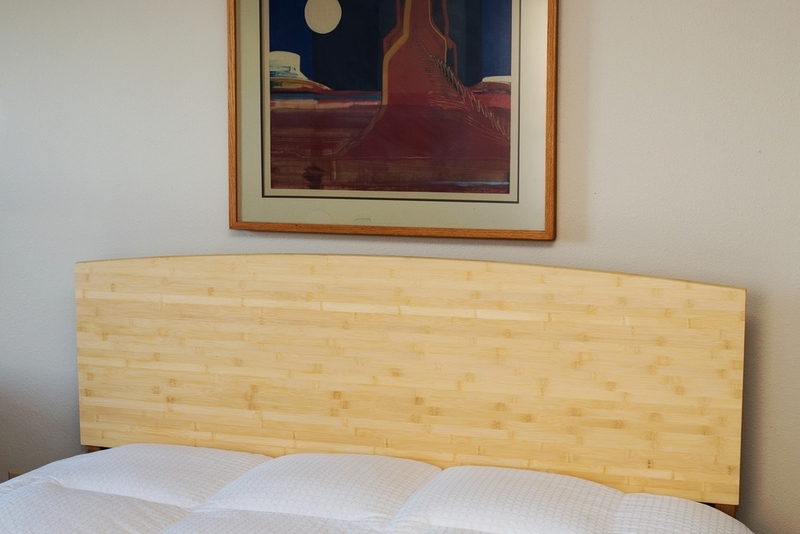 The Sandia Bed was created to capture the focal point of Albuquerque, Sandia Mountain. Sandia Mountain sits at the east edge of Albuquerque and rises over a mile from the Rio Grand river. It is home to the longest tram in world. Unparalleled views await the traverer atop the mountain. Sandia Peak has a great restaurant and is the top of Sandia ski area. For a wonderful outing, ride up on a full moon night and watch a beautiful sun set and an awesome moon rise at the same time. Wow! Our Sandia bed is an age old design that has always been a favorite for all age groups. This bed is available in Red Oak, Hard Maple and Light and Dark Bamboo. Like all of our beds, the Sandia does not have exposed connectors. Add a 16" Bed Table for your necessities and you have a complete setting. The Bandelier National Monument, in the Jemez mountains, is home to one of the best preserved villages of the ancient Pueblo People. Climb up into the cliff dwellings to get a view of the valley floor dwellings. This bed is reminiscent of the ladders used to climb to those high cliff dwellings. It is one of our newest beds which combines our home made dowels with gently curved boards for a rustic, authentic, New Mexico look. Shown in Red Oak with matching Tall Bed Table. One feature of New Mexico is our wide open vistas. You can see a sun set and a full moon rise from the same spot. What a treat. Our Full Moon bed captures that wonderful moment when the full moon breaks over the eastern horizon and is suspended on a flat topped mesa for a few moments of unparalleled splendor. Shown in Red Oak with a short bed table. Our Rainbow bed is one of the Alpha Wave family of beds. We just think it is special in its simple, graceful lines. This bed is available in Red Oak, Hard Maple, Light and Dark Bamboo. Shown in Maple with our short bed table. Not available in king size. From the high mountains of northern New Mexico comes the Taos Sleigh bed. Simple styling combines with clean lines to bring you a platform bed that has a taste of the rugged Rockies. The Taos Sleigh bed will accommodate mattresses up to 10" and is available in Red Oak, Hard Maple, Light or Dark Bamboo. Shown in maple with a Bed Table to accessorize your setting. Not availabe in king size. The Taos ski area is known for it's high ratio of expert to intermediate runs. It also boasts the longest, steepest slope in the country, Al's run. It will wear you out. Our Taos Daybed is twin size bed with matching Taos Sleigh bed arms. Add a few pillows for a comfortable deep seating area and then remove them for a quick guest bed. Shown in Red Oak. Pinon is a small town in Southern NM consisting of a post office and two churches. It is home to elk, deer, coyotes and wild pigs. The cattle ranchers who live in the area have a great sense of humor. The closest towns are Hope and Weed. Lots of pinon nuts too. The Pinon bed is part of the Alpha Wave line with two straight crosspieces, one step up from a Pecos bed. Shown in Hard Maple with a tall Bed Table. The eastern edge of Albuquerque there is a mountain that rises 5000 feet from town. That mountain changes every day and all though the day but it always gives a beautiful Vista to those who live here. The Vista bed was designed knowing that the grain of our Bamboo boards shows its beauty well on a large scale. The main feature of our Vista bed is the solid Bamboo panel that is 20” high and wider than your mattress. That wide Bamboo panel gives a stunning exotic look to the Vista bed that is hard to beat. The Vista bed is 3” higher than our standard beds since the panel extends well above the legs. The Vista bed legs are also available in different heights for different mattress thicknesses. This Vista bed is NOW AVAILABLE IN OAK, MAPLE, or BAMBOO. Sizes Twin, Double, or Queen. NEW: Premium bed upgrade for 5-3/4" rails (sides) and footboard xpiece. Also another upgrade available for headboard if you request it. East King 80-1/2" x 84"
Cal King 74-1/2" x 87-1/2"